Mrs. H Nicholas is the designated Child Protection Officer however should Mrs Nicholas be away from school the Deputy Headteacher Mr Richard Owen and Assistant Headteacher Mr Ian Evans will be Deputies. Staff are fully briefed on the procedures to be undertaken in the event of a disclosure. Written guidance has also been distributed to all staff and will regularly be updated when appropriate. Staff are also encourage to discuss areas of concern or doubt with Mrs Nicholas. 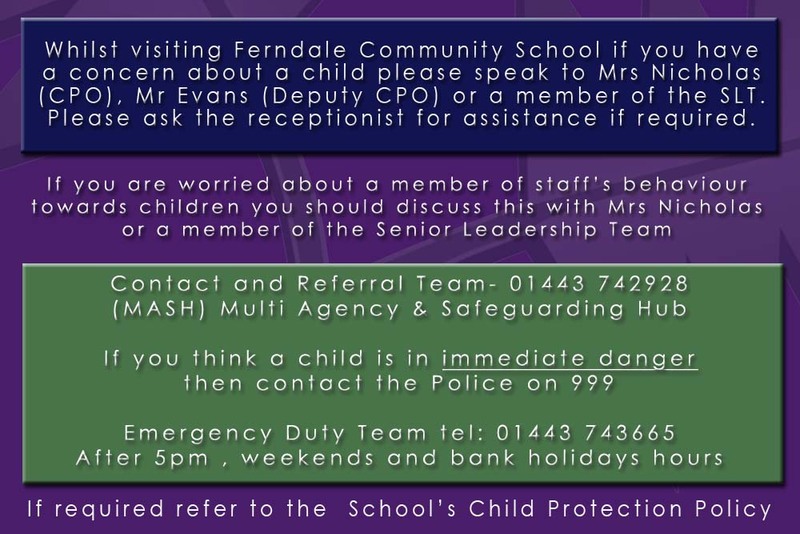 Ferndale Community School is committed to ensuring the welfare and safety of all children in school. 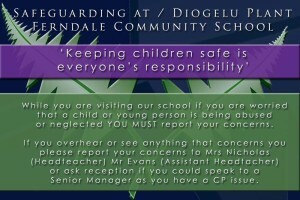 All RCT schools, including Ferndale Community School, follow the RCT Safeguarding Children Board procedures. 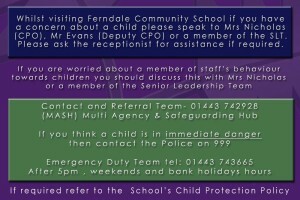 The school will, in most circumstances, endeavour to discuss all concerns with parents about their children. However, there may be exceptional circumstances when the school will discuss concerns with Social Care and/or the Police without parental knowledge (in accordance with Child Protection procedures). The school will, of course, always aim to maintain a positive relationship with all parents. We also recognise visitors to the school may see or hear something that may concern them and for this reason we also encourage them to share any concerns with the school following our procedures. The images below are shared with visitors and form part of the visitors badge when signing in at the school. In addition to school based staff and visitors information, our Governors are briefed and trained on Safeguarding. Our nominated Child Protection Governor at the school is Mr Mike Condon who is well trained in this field. If you would like to find out more information please click on the Child Protection Policy Autumn 2015 for the full content. This policy is presented and discussed at Governors Annually. You will find below additional links and information to external websites which may be of use to you. 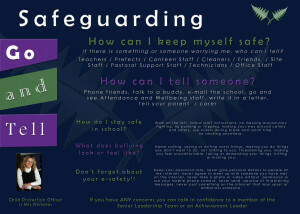 Please feel free to contact the school if you would like to see any additional useful links included on our Safeguarding page. 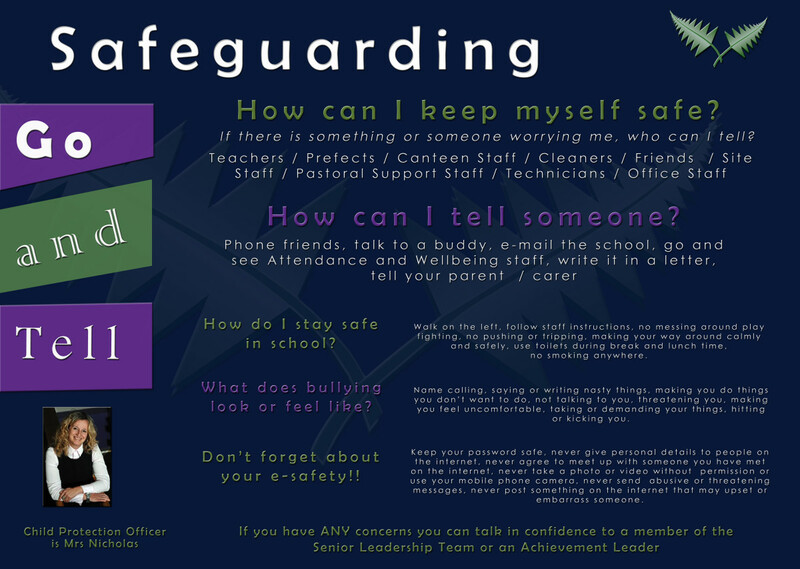 We are in the process of developing further information on E-Safety however pupils are regularly reminded and taught how to keep safe. You can find further information on many websites of which some are listed above.